Swap royal duties for some real action! Ultimate Macy might be a princess, but she knows how to fight with the futuristic NEXO Powers. Fire a Mace Rain with the 6-stud shooter, swing the Phoenix axe and tangle the enemy up in Jungle Dragon vines and sling them far! 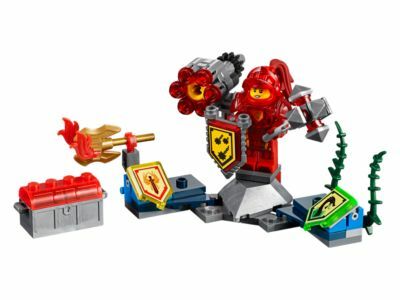 Upgrade your battle skills by scanning shields to obtain 3 NEXO Powers for your digital collection of unique abilities to outsmart Jestro and the evil Lava monsters in the free LEGO® NEXO KNIGHTS™: MERLOK 2.0 app. Scan for 3 NEXO Powers: Mace Rain, Phoenix Blaze and Jungle Dragon. This comes down to 12.79 cent per brick. The Ultimate Macy (70331) Lego set is available from the sites below. However, they do not offer delivery to your selected region. The Ultimate Macy (70331) Lego set is no longer directly available from the sites below. However, 3rd party partners of these sites might still have the set available. Alternate description Summon a powerful downpour with Ultimate Macy and her 6-stud shooter in this fun set, including scannable shields for unique NEXO Powers. Includes a minifigure.